Here's a new way to green mealtime - Re-Think It Inc. just launched Re-Play, a line of eco-friendly tableware for kids. The colorful collection is made in the USA from curbside collected HDPE plastic such as milk jugs. The result is lightweight, durable tableware that's free of BPA, PVC and phthalates. Utensils, bowls, spill-proof cups and divided plates are all available now. Read on to find out more. Re-Play’s eco-friendly tableware for kids is made from curbside collected HPDE plastic such as milk jugs. Sound too dirty for dinnertime? Not to worry, the recycled plastic is sanitized with an FDA-approved process to remove anything absorbed by the plastic resulting in food-grade materials. The product packaging is also eco as it’s made form recycled paperboard. Beyond being eco-friendly, the tableware is kid-friendly, too. 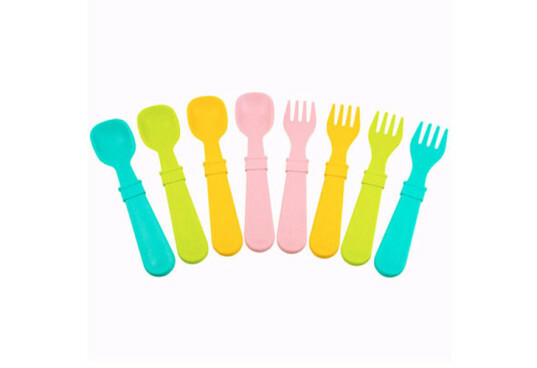 Kids will love everything from the array of colors to choose from when grabbing a fork or spoon to the divided plates that keep their peas separate from their potatoes. You’ll love that the FDA-approved recycled plastic collection is dishwasher safe. And once your kids are ready to use the same dishes as you, you can toss Re-Play in the recycling bin rather than the trash can. 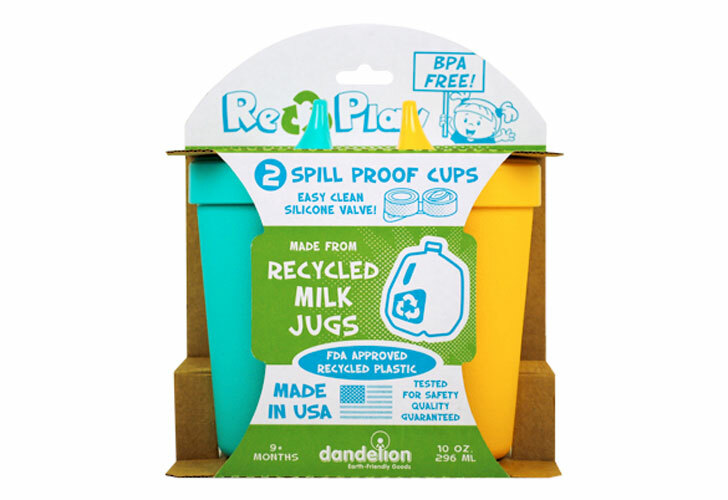 Re-Play's eco-friendly tableware for kids is made from curbside collected HPDE plastic such as milk jugs. Sound too dirty for dinnertime? Not to worry, the recycled plastic is sanitized with an FDA-approved process to remove anything absorbed by the plastic resulting in food-grade materials. The product packaging is also eco as it's made form recycled paperboard. You'll love that the FDA-approved recycled plastic collection is dishwasher safe. And once your kids are ready to use the same dishes as you, you can toss Re-Play in the recycling bin rather than the trash can.